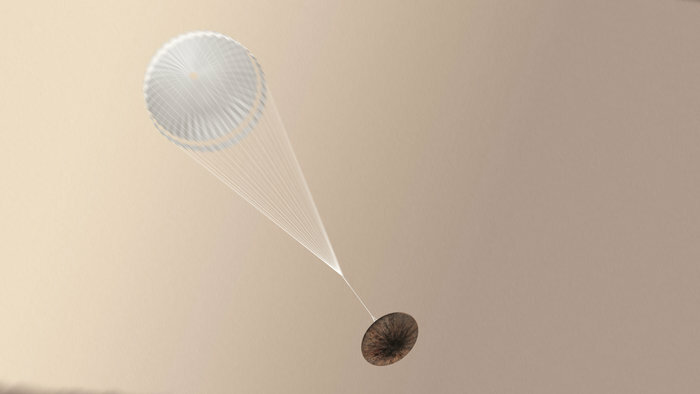 October 20, 2016 – Essential data from the ExoMars Schiaparelli lander sent to its mothership Trace Gas Orbiter during the module’s descent to the Red Planet’s surface yesterday has been downlinked to Earth and is being analyzed by experts. The data have been partially analyzed and confirm that the entry and descent stages occurred as expected, with events diverging from what was expected after the ejection of the back heat shield and parachute. This ejection itself appears to have occurred earlier than expected, but analysis is not yet complete. “Following yesterday’s events we have an impressive orbiter around Mars ready for science and for relay support for the ExoMars rover mission in 2020,” said Jan Wörner, ESA’s Director General.